This chapter describes procedures for reorienting a spacecraft from one attitude to another. Sections 19.1 and 19.2 describe maneuvers using magnetic coils and Section 19.3 describes maneuvers using gas jets. Section 19.4 then describes procedures for inertial guidance maneuvers. Finally, Section 19.5 discusses the special class of attitude acquisition maneuvers in which the spacecraft starts in an unknown or uncontrolled attitude and ends in an attitude appropriate for mission operations. This chapter uses the general attitude control concepts introduced in Section 15.3 as well as the equations of spacecraft motion presented in Sections 16.1 and 16.2. This is a well-known equation (see, for example, Goldstein, ), describing the precession of s about the magnetic field, B, with an angular velocity, Qp, which is either parallel or antiparallel to B depending on the sign of the coil state parameter, u. This is illustrated in Fig. 19-1. Xj = - sin ax + cos ay Similarly, y, is a unit vector along sXx, and is given by ys=s X ks = — sin S cos ax — sin S sin ay + cos Sz Taking components of Eq. (19-6) along xs and y,, we obtain da urn. 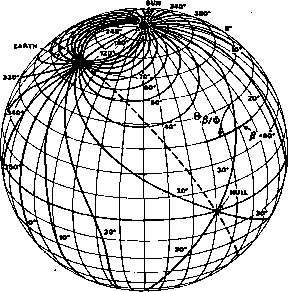 Here, Bx, By, Bt are the celestial rectangular components of the geomagnetic field. Figure 19-2 provides a physical interpretation of Eqs. (19-8) and (19-9). 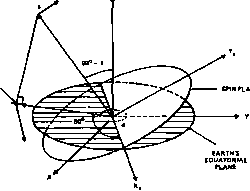 The torque component along x, rotates the equatorial projection of the spin vector around the celestial z axis and therefore is the cause of right ascension change. Similarly, the torque component along ys pulls the spin axis toward the celestial z axis, which results in declination change. Integration of Eqs. (19-8) and (19-9) to accurately predict the total spin axis motion requires an accurate knowledge of the geomagnetic field. However, the analytical characteristics of magnetic control maneuvers may be obtained from the dipole model presented in Appendix H. We discuss spin axis maneuvers for two limiting cases of satellite orbits: equatorial and polar.